On year round water with large boat dock. Located on beautiful Norris Lake with 800 miles of shoreline. Water front property. Kayaks, paddle boat. Easy access to lake. Close to Sequoyha Marina by Water. On a quiet part of Norris lake. Take Caryville exit off I-75 towards Big Creek 4. The cottage has approximately 1600 square feet with 4 bedrooms. Two full baths - one on each level. Central air conditioning. 10 x 30 deck upper level and patio lower level, both with lake view. Recreation room in lower level has a ping pong table and fold out couch. Eat-in Kitchen with stove, refrigerator, dishwasher, disposal, and microwave. Direct TV for Summer Rentals. Kitchen utensils furnished (cookware, dinnerware, etc. ; toaster, blender, coffee maker, spices, etc.). Trash Pick-up. Maid service included at check out. Leave the refrigerator as is, and fill up the dishwasher prior to leaving. The cleaning service will clean up and empty dishwasher. Washer and dryer. Television. DVD. Gas Grill. Chairs and tables for decks. Concrete steps to the lake, directly to boat dock. Small fire pit near the water. Firewood not provided. Large covered dock 30'x20' with attached 16'x19' swim dock. Also incudes jetski dock, night time lighting, covered picnic table -120V power, and ladder into lake. Great for swimming. Paddle-Boat and 2 Kayaks provided. 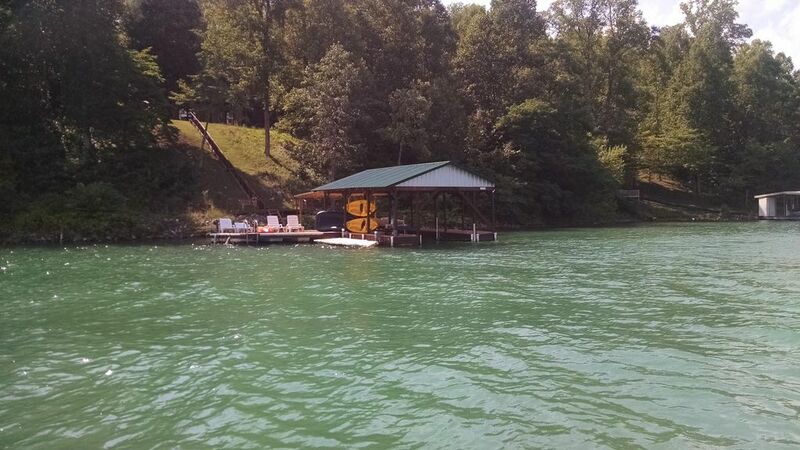 Additional Information: This property is located on Big Creek 4, a quiet part of Norris Lake. Water all year. Steps to lake go all the way to the dock in the summer. We have been going to Norris Lake for over 20 years. The lake is great. Good for skiing, tubing, wakeboarding, etc. Take a trip daily to different marinas, each with food and gas. Play cards on the dock day or night. Purchased the land in 1989, and started to build in 1990. Updated and well maintained. Our kids were small and it was a great place to watch them grow up. We try to provide everything so your stay can be pleasant. Cleaning service and trash removal is included. Right on the year round water. Covered Dock great for enjoying the water. Paddle boat and 2 Kayaks available. Also try out the ping pong table. Sit on the dock and enjoy the views. Great for diving, picnic, or just floating in the water. A few movies and books are provided. Small fire pit near the water. Ride to Deerfield Marina by boat and call to be picked up to play Deerfield Golf Course. Beautiful course. About 1/2 hour away by boat. Satellite TV in Summer months only. Trash pick-up included. Housekeeping provided at the end of your stay only. Sheets and towels included. Please bring beach towels. We took our family here for Thanksgiving, my mother in law , went on and on about how well the kitchen was stocked, we really didn't need to bring anything. They had all the seasonings you could ever need... There is service for verizon but not AT&T, we only caught one fish , it was too cold and fish weren't biting. We had a ghost story contest by the fire pit at night. The kids love the ping pong, we went into town to hit up the redbox, and watched movies. There is nothing in town though except plenty of grocery and fast food options, but now I know the history behind the giant green dragon exit that Ive passed for years since my childhood along I-75 ! Ha! Plenty of TP and paper towels, the drive into town isn't long, but its narrow and winding. We saw geese in the yard and deer. It is very quiet, and peaceful. We hope to go back in the summer , so we can enjoy the dock more ! We even grilled our turkey on their grill ! Thank you for letting us use your house ! The Whispering Pines was the perfect place for our fall break. The house is well-equipped and well-cared for. The view is amazing! We enjoyed smores by the lake at the fire pit and kayaking in the cove. The open floor plan provided the perfect setting for conversation and laughter during meal preps and games. The Goodings have thought of everything for a peaceful retreat. Great place to vacation, swimming, kayaking, paddle boating and sunning on floating deck. Fully furnished with satellite TV, great kitchen and four bed rooms made for a roomy stay for my wife and I together with our kids family. Two kayaks, a canoe and a paddle boat on a pristine lake made for great fun. We all enjoyed swimming and sunning off the flotting dock. Had a very nice stay, no problems whatsoever. Initially thought there was an AC issue-THERE WAS NOT- Mark, host/owner was very prompt to respond, cottage is well equipped, (only negative was we couldn't bring our small, well-trained adult dog, however, if it was my cottage, I'm pretty sure I wouldn't allow pets either! ), overall great experience and would definitely BOOK AGAIN! Overall it was a very nice and well taken care of place. Love the provided entertainment (kayaks, pong, etc). The half covered and half uncovered dock was great. My only complaint (which I was warned prior about) was there is no Wi-Fi and you get next to no cell service. Great place to spend a week on Norris lake. This was our second time renting this property.House was neat and clean. Had everything we needed to enjoy our stay at Norris lake.Location is excellent. We will stay there again. Located on beautiful Norris Lake. Water front property 50 miles (one hour) north of Knoxville, and two hours from Gatlinburg or Cades Cove. Restaurants and shopping are 10 miles in nearby Lafollette. Easy access to lake. On a quiet part of Norris lake. Take Caryville exit off I-75. 2 with queen size beds on lower level and fold out couch. Two full baths - one on each level. Central air conditioning. 10 x 30 deck upper level and patio lower level, both with lake view. Recreation room in lower level has a ping pong table and fold out couch. Eat-in Kitchen with stove, refrigerator, dishwasher, disposal, and microwave. Kitchen utensils furnished (cookware, dinnerware, etc. ; toaster, blender, coffee maker). Washer and dryer. Satellite Television in the summer. DVD. Gas Grill. Floating and covered boat dock and jetski dock. Great for swimming. Paddle-Boat and 2 - Kayaks provided.